Glenn Close first played Nobbs 30 years ago, off-broadway, and it’s been her lifelong passion to get the story up on screen. Good on her, but it’s a labour of love in more ways than one. Close, who co-wrote the screenplay, delivers little insight into this sad-sack enigma or sexual inequality in the 19th Century. And you can’t shake a nagging sensation that Nobbs was more interesting when the younger Close played him. Being 25 rather than 55 would have ratcheted up the tension in the tragic triangle between Albert, Joe and Mia Wasikowska’s callow chambermaid. Instead, when Close is wooing Wasikowska with promises that “our wedding will be a great wonder”, it comes off as creepy and delusional rather than heartfelt and moving. 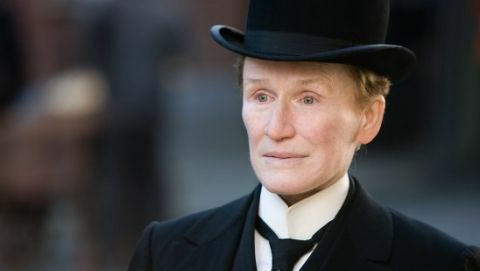 And that’s before director Roberto García unleashes full-on melodrama, by which time Albert Nobbs is flirting with silliness. In playing a woman who’s had to repress femininity just to survive, Close delivers a performance of such walled-in seclusion it’s near impossible to pierce Nobbs’ humanity. For a grand dame like Close, that’s an insurmountable and fatal distraction, Oscar nomination or not, and a stark contrast to the mesmerising McTeer, whose genderbending gets shamefully little screen time but whose vitality leaves you wishing this unhappy, plodding tale had been called Hubert Page instead.